SKU: BRAC-WOL-H. Categories: Bracelets, Cuffs & Arm Rings, Heavy Braided Bracelets. Our Heavy Wolf Bracelet is not for the feint of heart! It is constructed with a heavy and very substantial braid of wire, and is approximately 3/8 inch (10 mm) thick. It is available in bronze and sterling silver. Which Bracelet Is Right For You? 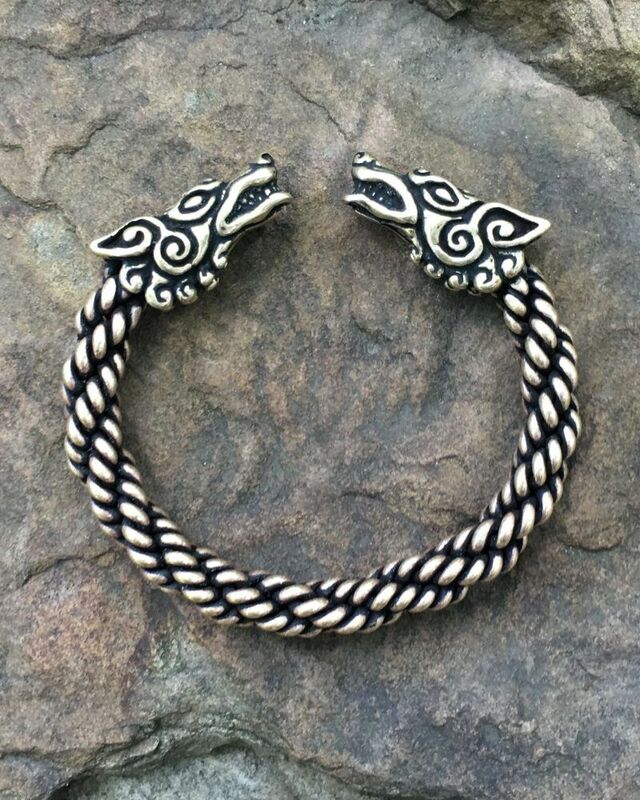 We also offer a light wolf bracelet and a medium wolf bracelet. Despite its ferocious and terrifying reputation as a murderous creature, the wolf is actually a very intelligent and social animal, honorable and loyal to its pack. They are skilled hunters, cunning problem-solvers, and fearless warriors in battle. Roman legend has it that two founding brothers were raised and suckled by a she-wolf. Her name was Lupa, an immortal she-goddess of the Romans. And the two brothers she raised, Romulus and Remus, went on to found the great city of Rome. The Celts believed the wolf to be a divine creature who ruled over the winter months, overseeing a period of death and purification, which the Celts believed to be necessary in order for the world to be reborn in the spring. The wolf was also a companion of Cerridwen, godddess of the Moon, and it was said the wolf would hunt down the sun and gobble it up so that the moon’s power would come forth. In Norse mythology Odin had two wolf companions, named Freki and Geri. Much like Odin’s ravens, Huginn and Muninn, Freki and Geri also offered Odin otherworldly wisdom. They did this in by traveling far ahead of Odin on foot and then returning to report any news they learned. This allowed Odin know the best hunting grounds, as well as the status of the people. Odin’s wolves would also join him on the battlefield, and were one among many supernatural creatures who aided the Valkyries in transporting fallen warriors to Valhalla. Order with confidence knowing our site is protected by SSL (Secure Sockets Layer), the most trusted security for online ordering. Your heirloom quality jewelry purchase will retain its quality for generations. We stand by it and will refund for any defects. We guarantee you'll be 100% happy with your purchase and will refund or exchange for you if you're not happy for any reason. Here at Crafty Celts, we offer historically inspired Irish and Viking jewelry, handcrafted from bronze, copper, and sterling silver. Our purpose is to celebrate our heritage by recapturing and preserving the traditions of artistic achievement put forth by the ancient Celtic peoples. We take great pride in the quality and craftsmanship of our jewelry, as well as in the elegance and authenticity of our designs. Crafty Celts Copyright © 2019.